Ginza is an upscale shopping and entertainment district in Tokyo. Ginza (銀座) means silver place, which was named after a silver-coin mint established in the area a few hundred years ago. As the neighborhood is one of the most expensive places in Tokyo, the name can’t be more fitting today. It is the playground for Tokyo’s rich and the famous. But the energy and livelihood in Ginza day and night make this area on top of Tokyo’s must-see list for everyone. 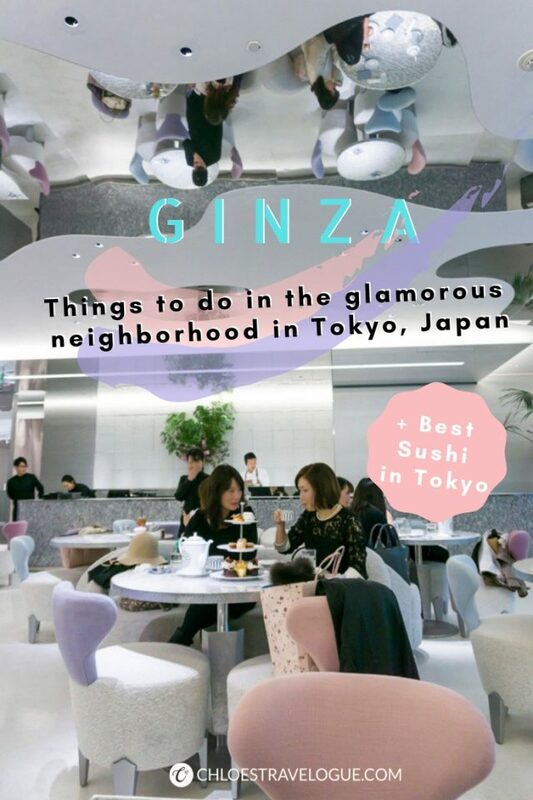 Whatever is on your Tokyo bucket list, Ginza ticks every box. Watch a kabuki play at Japan’s most symbolic Kabukiza theater: Cultural experience (check). Shop ’til you drop at Japanese mega department stores and shopping malls: Japan souvenirs (check). 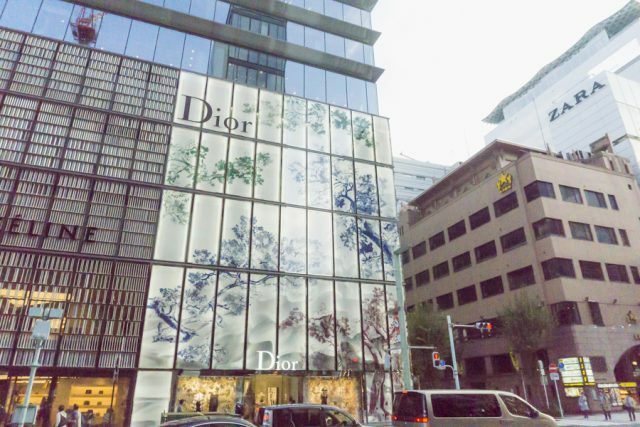 Appreciate contemporary arts at the Hermes Tokyo flagship store then indulge yourself with gourmet desserts at Dior Cafe: Rub your shoulder with Japanese high class (check). Looking for the best sushi in Tokyo? Tsukiji jogai is at the stone throw away from Ginza (check). 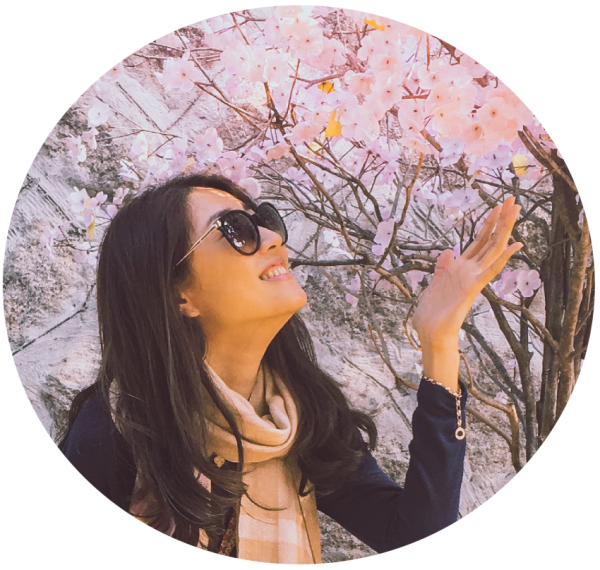 And the list goes on with so many things to do in Ginza. A Kabuki performance consists of several acts (plays and dances) and lasts up to four hours. However, travelers with cultural curiosity can purchase a 30-minute Single Act ticket to see how it’s like without committing a half day. This ticket can only be bought on the day of at the theater. The ticket price varies depending on the show (¥600-2,000). Also, keep in mind that all Kabuki plays are in Japanese. Although the pamphlet offers an English synopsis, non-Japanese speakers might want to rent earphone guides or line-by-line translating guide (¥500+¥1,000 refundable deposit) to enjoy the cultural experience fully. Even if you are not interested in watching the Kabuki performance, it’s worth to visit inside the Kabuki Theater Ginza. Here you will find Kabuki souvenir shops, snacks and restaurants. They are located on the underground mall at the Higashi-Ginza station or throughout the floors inside the Kibikicho Plaza. Location: Right off the Higashi-Ginza station Exit 3, or 5-min walk from the Ginza Station Exit A7. (Kabukiza Theater Location) | Opening Hours: 10:30 am - 8:30 pm | Click here to check Kabuki schedule. For a more contemporary cultural experience, visit Le Forum by Hermès Tokyo. As I mentioned in my earlier post, I was intrigued by the connection of the luxury brands and contemporary arts. Although I had to miss the Espace Louis Vuitton Tokyo, I was determined to visit this gallery by Maison Hermès Ginza. 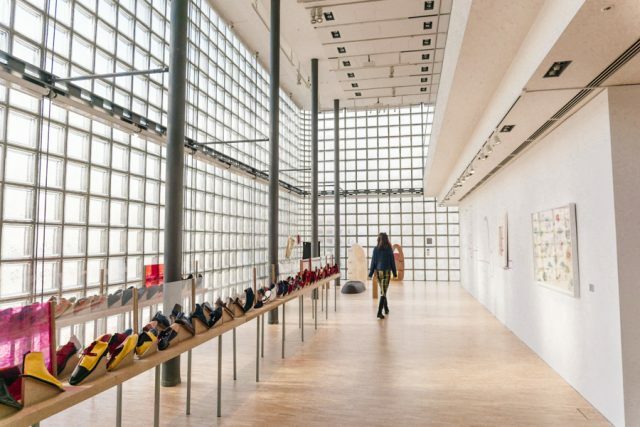 Similarly to the Espace, Le Forum hosts art exhibits by the French and Japanese artists around the world. After the Oprah Winfrey incident in Maison Hermès Zurich, I was a bit intimidated to walk into this flagship store. However, Japanese employees here were extremely polite and welcoming. After briskly browsing through gorgeous Hermès scarves and watches, I took the elevator at the back of the store to go up to the 8th floor. At the time of my visit, the exhibit titled Les Mains sans sommeil was in display, featuring works by a group of artists who participated in the Artists’ Residencies program at various Hermès workshops in France. These artists collaborated with Hermès artisans to turn raw materials - silk, leather, silver and crystal - into a piece of art. I enjoyed the craftsmanship and creativity exhibited in solitude as the gallery was empty. What contrast to the busy streets outside! Right next to the Maison Hermès Ginza is the Ginza Sony Park. Although a small garden featuring humongous Japanese bonsai trees catches the eyes in the middle of Ginza district with few parks, the “Garden of Ginza” is more exciting than greenery in the urban jungle. The Ginza Sony Park project converted the former Sony Square into a public space and vertical park. Sony is collaborating with partners to bring many pop-ups and concept stores from a to-go beer bar, coffee shop and Japanese confectionery shop, and host public events. What interested me the most was the satellite studio of TOKYO FM parked on the ground. I say “parked” because the studio is a truck! When I first noticed a parked tin truck, I assumed it to be a food truck. It took me by surprise when I found out it was a live radio show booth. Ginza Sony Park will stay open until 2020 when the new Sony Building is scheduled to be built. So visit this experimental space while it is open to the public! Location: Sony Building Tokyo in the Sukiyabashi intersection (Ginza Sony Park Location) | Opening Hours: 5 a.m. - 12:30 a.m.
Did you know Ginza once was burned down to the ground? From the Ginza Great Fire in 1872 to the Great Kanto Earthquake in 1923 to the air bombings in 1945, the area has drastically changed its landscape throughout history and evolved into what you see today. Because of this unique history of the neighborhood, taking the Ginza architecture tour by a historian or professional guide would be a meaningful and worthwhile experience to have a better understanding of what you see. Enjoy the beautiful windows on the Mikimoto building (photo above) and learn about the restoration of this unique capsule house. You don’t need to be an architect to appreciate the old and new buildings in the streets of Ginza! Ginza is pedestrian friendly (on weekends)! Ginza Chuo-Dori (“central avenue”) is the main street through the shopping district, lined with department stores like Wako and Mitsukoshi. This area always gets jam-packed with locals, tourists and traffic. Chuo Dori street is closed to automobile traffic on Saturdays and Sundays between 12 p.m. and 5 p.m. So visit Ginza on weekends when the main road becomes a pedestrian runway. Since Ginza is best known for its shopping scene, there should be some time earmarked for obligatory shopping when visiting the Ginza shopping district. While Ginza offers luxury brand shopping like Omotesando, in my opinion, it is the best place in Tokyo for shopping at the department stores. You can’t miss this landmark of Ginza. 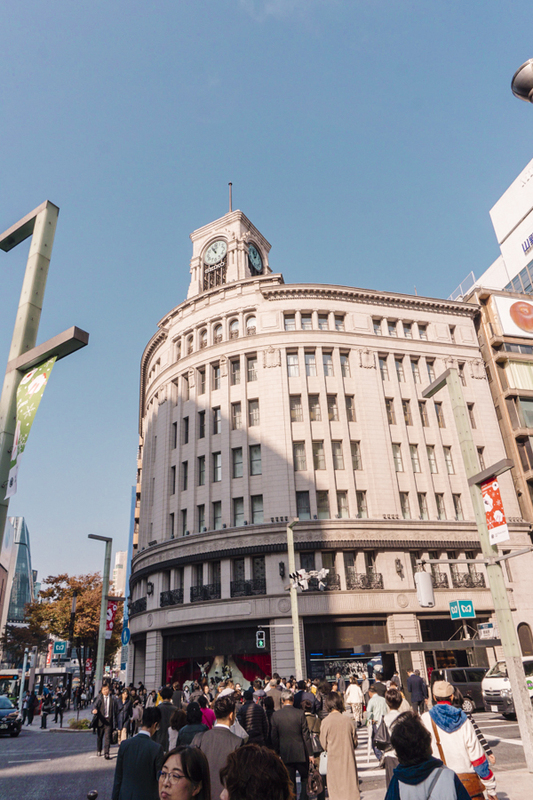 Wako Ginza is a classic Seiko clock building. The famous clock tower plays chimes 45 seconds before the hour and rings the bell on the hour. Wako opened its door as watch and jewelry specialty shop and expanded to a department store with women's and men's clothing. Mitsukoshi Ginza is a mega department store with 80+ years of history. You will find everything you can imagine to buy at a department store, ranging from women/men/children’s apparel, cosmetics, accessories, house decorations, etc. Notably, this department store stands out with its gourmet food selections on the basement grocery. If you are shopping for wagashi (Japanese confectionery), this place is a must. Pro Tip: Mitsukoshi Ginza offers a hands-free shopping experience, meaning you can shop all you want and ask the purchased items to be sent to a designated location inside the department store to be picked up later. They even deliver to a limited number of hotels in Tokyo, so ask if you are eligible for a free hotel delivery. 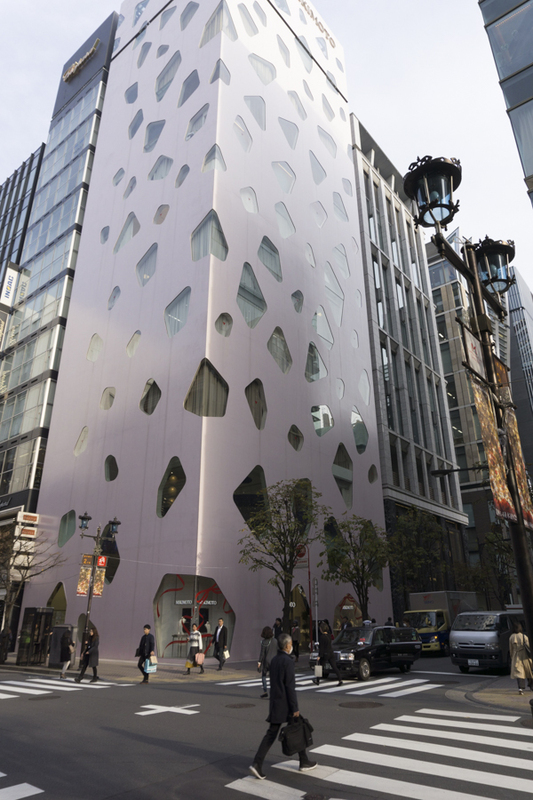 Tokyu Plaza is one of Ginza’s largest commercial complexes and new additions to the area. 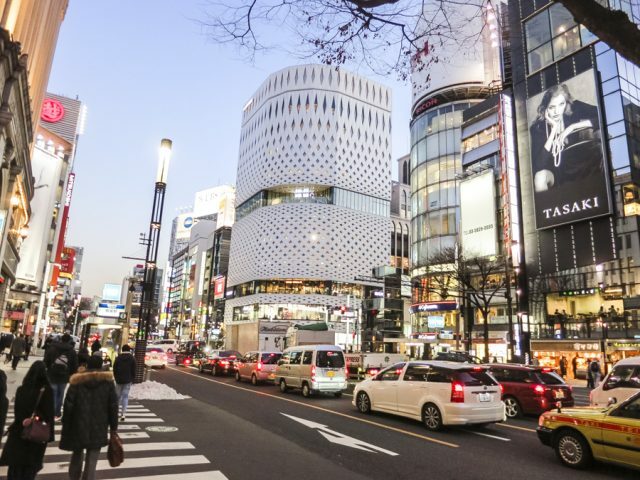 Located in the Sukiyabashi Crossing, Tokyu Plaza boasts the architectural beauty that resembles Edo Kiriko glass - traditional Japanese craftwork. The plaza houses Lotte Duty Free Ginza, as well as many other retailers and restaurants. The KIRIKO TERRACE on the rooftop is a hidden gem, where shoppers can get desserts or sip coffee with a view. 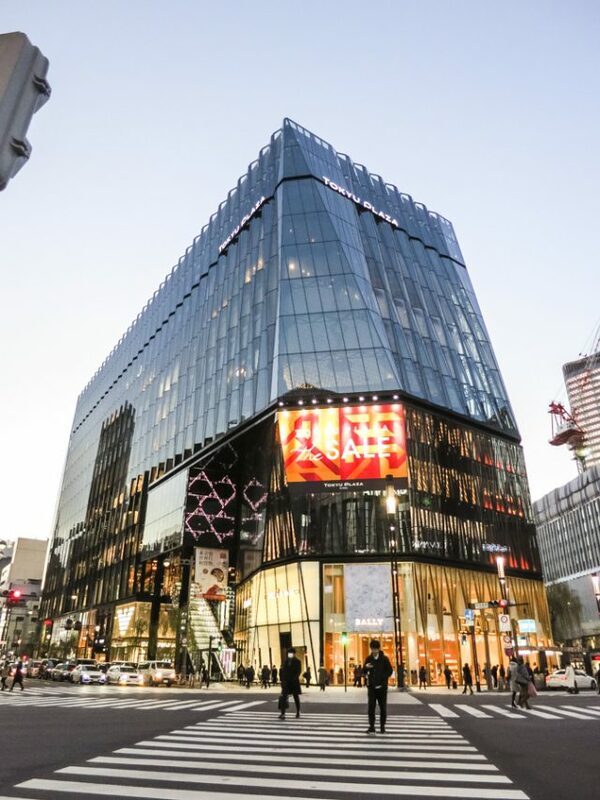 Opened in 2017, Ginza Six is a new addition to the Ginza shopping district. It is the largest commercial facility in the area, designed by the renowned architect Yoshio Taniguchi, who created the New York Museum of Modern Art. Besides the fashion brands, this department store features popular stores around Japan. For example, a famous matcha desserts shop from Kyoto, Tsujiri, opened its only store in Tokyo at Ginza Six. Also, the Tourist Service Center is on the first floor at Ginza Six. Visitors can stop by to receive tourist information, currency exchange and luggage services. 1. Duty-Free Shopping: Each department store has a designated tax-free counter for the tourist's convenience. So be sure to bring your passport and remember to visit the counter before leaving the building. 2. Free Lockers: Ask for coin lockers or luggage service. You can store your belongings while you shop. Some coin lockers return the coin once you take belongs out. Are those high-end shops in Ginza overwhelming or intimidating for you? Then, visit Uniqlo’s largest store in the world in Ginza for a more wallet-friendly shopping experience. 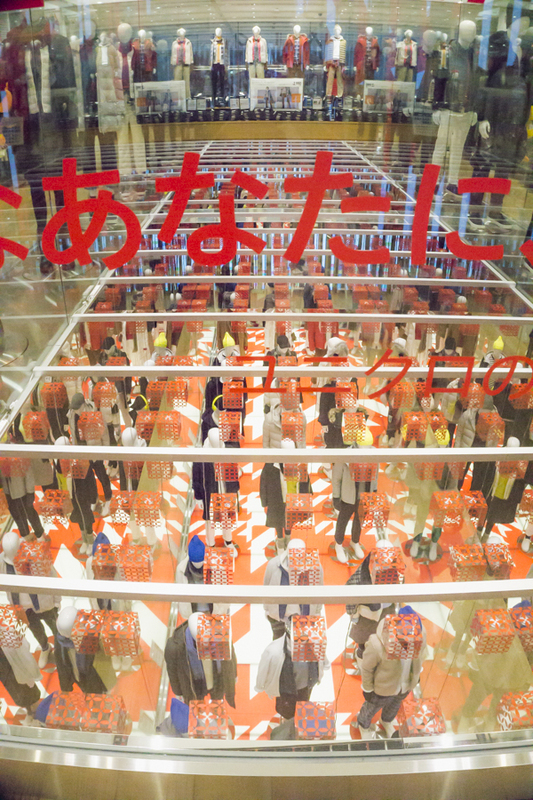 The Uniqlo Ginza flagship store is a 12-story, duty-free shop that can easily occupy you for a couple of hours. Despite its scale and extensive selections, I didn’t find any exclusive items here. That could be just my experience. But I think it is okay to skip if you are in a rush as Uniqlo is available in many other countries around the world. Where can you find Hello Kitty in Tokyo? Everywhere! Where is the world’s largest Sanrio store? In Ginza! Sanrio World Ginza is a flagship store with the largest selection of Sanrio family character goods, including Hello Kitty, My Melody, Keroppi, Cinnamaroll, Gudetama, etc. But this is THE ONE place you must visit in Tokyo for Hello Kitty fans, like me. Let me tell you why. In the U.S. (or any other western world), Hello Kitty is only for the little girls. However, in Japan, there is no social shaming for grown women to like and want Hello Kitty character goods! What this means is that you can find so many varieties of high-quality Hello Kitty items for the matured you cannot find elsewhere. The first floor of Sanrio World Ginza is dedicated to Hello Kitty. From women’s apparel to travel essentials, dolls, purses, shoes, pottery, stationery, towels, Swarovski crystals, watches and jewelry, you name it! Oh, did I tell you that there is a nail salon dedicated to Hello Kitty designed nail art? When you think there is nothing more you can find with Hello Kitty, wait until you go to the second floor. You will be surprised with endless Hello Kitty character goods. The upstairs store also carries all Sanrio family goods. Pro Tip: Sanrio World Ginza is a tax-free shop. If you spend more than ¥5,000, you are eligible. Keep in mind that the first-floor and second-floor shops are operated separately, meaning you will need two separate transactions. Therefore, looking around both floors before making a purchase would be wise. If you are not already familiar with Japanese beauty, Shiseido is one name you should remember. Shiseido is the largest cosmetics company in Japan that originated in Ginza since 1872. Not to be confused with hundreds of other Shiseido shops in Tokyo (or Ginza), Shiseido the Ginza is the brand’s flagship store, located where the company started. Shiseido the Ginza is more than just a cosmetics store. While it offers a wide variety of cosmetics on the first floor, it also houses a skin care spa, as well as a hair and make-up salon on the second floor. While at it, visit the Shiseido Gallery, located in the basement level of the Shiseido building. Shiseido Gallery is claimed to be the oldest art galleries in Tokyo operating to date, exhibiting contemporary arts. Shiseido also offers a cafe - Shiseido The Tables, and a restaurant - Shiseido Parlour. ↠ Hey, is this your first time in Tokyo? Click here for Tokyo's Best Neighborhood Guide. It covers 9 best areas to stay in Tokyo for tourists, what each neighborhood is best for and things to do. Dior Café by Pierre Hermé is one of a few locations in the world you can experience gourmet French desserts in the atmosphere of House of Dior. Even though I loved the energy of the Ginza street, after a half-day shopping and excursion, I wanted a peaceful rest away from the hustle and bustle of the city. I couldn’t think of any other “Ginza way” to have a small bite of sweetness in the afternoon and rest my feet. Each menu is a piece of art, beautifully presented in the Dior tableware. Without a doubt, the desserts and service at this luxury cafe are superb. As expected, it comes with the steep price tag plus 13% service charge. However, it is a perfect place to celebrate special occasions or have a taste of a high-class life in Ginza. By the way, make sure to check out the fancy restroom. It is a trippy experience to find yourself surrounded by mirrors while taking care of your business. Take a deep breath and stay calm even if you can’t find the way to open the door for a second (like I did!). Ginza is an excellent place to explore one of the many Michelin restaurants in Tokyo. Among those Michelin restaurants, Katsuzen stands out as it is the only Michelin-stared tonkatsu restaurant in Tokyo. Because even ramen shops in Japan receive Michelin stars, you might ask what all the fuss is. But tonkatsu is unassuming comfort food in Japan and “unlikely” food to earn Michelin stars in my opinion. The lunch menu for its famous kurobuta tonkatsu set will cost about ¥4,700, which is steep for tonkatsu. But pretty affordable for a fine dining experience at a Michelin restaurant in Ginza. Don’t you agree? Still not convinced to try this “best tonkatsu in Tokyo” according to the Michelin Guide? Find out which affordable Tonkatsu restaurant I liked here. Craving for sushi in Ginza? If you are lucky, you can enjoy arguably the world’s best sushi in Ginza. Sukiyabashi Jiro is a sushi-only restaurant located underground in a Ginza subway station. But don’t let the humble facade fool you. This 10-seat sushi bar is a Michelin three-star restaurant that will cost you at least ¥30,000. Reservation is tough. I heard you need to try at least three months in advance. Is it worth it? I don’t know, but I have to tell you I’m convinced that it IS after watching (and drooling over) the documentary - Jiro Dreams of Sushi. You can decide yourself. Location: Ginza Station Exit C6 (Sukiyabashi Jiro Ginza Sushi) | Opening Hours: 11:30 am - 2 pm, 5 pm - 8:30 pm (Closed on Sundays) | Reservation: Ask your hotel concierge. For a more affordable option, Sushi no Midori is a popular sushi restaurant with multiple locations throughout Tokyo. Although off the main Ginza street, Umegaoka Sushi No Midori Sohonten is a local favorite usually lined up by the locals and tourists. Good news is that the restaurant now offers reservation (click here to reserve your spot). When you make it there, try their ever-popular grilled eel nigiri. Ginza is a great place to find gourmet sushi restaurants. But if you don’t have to eat sushi in Ginza, I’d recommend hopping on Tokyo Metro over to nearby Tsukiji Market. Most of the prominent Ginza sushi places proudly advertise that they source their fresh seafood from Toyosu Fish Market (formerly Tsukiji), so why not go directly to the source? Quick Facts. As of October 2018, the Tokyo Central Wholesale Fish Market (i.e. Tsukiji Fish Market) has moved to the further East of Tokyo and become Toyosu Fish Market. If you want to see the tuna auctions, you will need to wake up super early in the morning to visit Toyosu Fish Market before the dawn. However, Tsukiji outer market “Tsukiji Jogai” remains open to serve customers to buy fresh seafood, dried fish, vegetables and fruits, as well as kitchenware. Where is the best sushi at the Tsukiji Fish Market? That is the million dollar question! I think it might be more challenging to find an average sushi restaurant in Tsukiji Jogai, which is traditionally believed to be the area serving the best sushi in Tokyo. Regardless, I was on the same boat as many of you both times I visited Tsukiji in fear of falling into a tourist trap. After walking around Tsukiji Jogai for a while in search for a sushi restaurant, I settled in at Tsukiji Itadori Bekkan tucked in a small alleyway. I liked the fact that there was no hustlers or gimmicky advertising signs inviting tourists into the restaurant. I stood there for a few minutes to observe the chef and customer interactions at the sushi bar on the first floor, which was wide open in the alley. I opted to sit at the bar, which I believe is the best way to enjoy sushi. I ordered one from the nigiri lunch menu and a bunch of a la carte items. I didn’t know the Japanese translation of yellowtail, so I showed a photo of my favorite fish to the chef. He had no problem understanding what that was. I was also impressed with the freshness and different texture of seafood at Tsukiji Itadori Bekkan. Location: Kaneshin Suisan Building (Tsukiji Itadori Bekkan Location) | Opening Hours: 7 am - 10 pm (Sat & Sun closed at 9:30 pm) | Reservation accepted. | Credit cards accepted at dinner time. From the glamorous shops to chic fashionistas on the street to beautiful buildings, I never get bored in Ginza. If you want to experience the hustle and bustle of Tokyo during the day and night, make sure to visit Ginza next time you are in Tokyo. 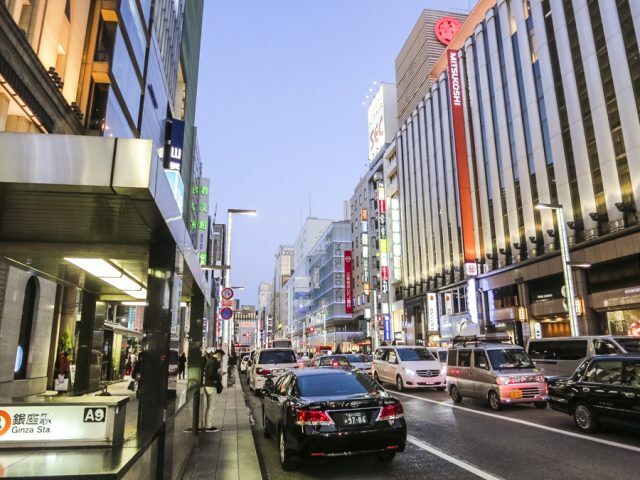 Hope this list of what to do in Ginza helped your day more fun there!